Today marks eight years that have passed since the untimely death of former Major League Baseball pitcher Darryl Kile. Although his life was cut far too short at just 33-years old, Kile's legacy as a player, friend, husband, and father remains alive and vibrant. Wherever he went, whatever he did, Kile was highly respected and well-liked. All readily agreed, that the three-time All-Star was an accomplished pitcher, but an even better human being. The 6' 5" right-hander began his professional career with the Houston Astros and made his big league debut in 1991. Two years later, the soft-spoken Californian put together a breakthrough campaign when he went 15-8 with a 3.51 ERA that included his first All-Star recognition. That season, Kile also etched his name in the history books by firing a no-hitter against the New York Mets. He dominated hitters with his signature hard breaking curveball and came just one fourth-inning walk away from a perfect game. In his final season in Houston, Kile helped lead the Astros to their first playoff appearance in 11 years. He finished fifth in the Cy Young voting by virtue of his 19-7 record and 2.57 ERA. Kile departed via free agency that offseason when the Colorado Rockies would not take "no" for answer. Like many others before and after, he struggled in the "Mile High" city as his trademark pitch lost bite in the thin air, but he never made excuses. After two disappointing seasons, the Cardinals acquired the big righty, figuring that a change of scenery might get him back on track. The gamble proved to be tremendously astute as Kile recorded a 20-9 record and led the team on a run that finally ended in the NLCS. Kile followed that up with another superb campaign in 2001, combining with Matt Morris to provide a formidable one-two punch at the top of the rotation. Many credited the veteran's leadership with transforming Morris into a 22-game winner. After two consecutive trips to the postseason, the Cardinals were back atop the NL Central Division standings on June 22, 2002. When Kile did not arrive at Wrigley Field, hotel personnel found him motionless in his room. The game was postponed and later it was determined that the beloved Cardinals player had suffered cardiac arrest as a result of blocked coronary arteries. A pall swept over the team. Morris lost 15 pounds over the next several weeks. Suddenly the heat of a pennant race lost is importance, but eventually the team somehow transformed their grief into motivation to make a return trip to the NLCS. For his widow, Flynn, and their three small children left behind, it was surely even more difficult. All were comforted by the great memories of the kind, supportive man who drew a following without even trying. As good as he was performing on the baseball field, all agreed he was even better in everything else that he took on or touched in his tragically shortened life. 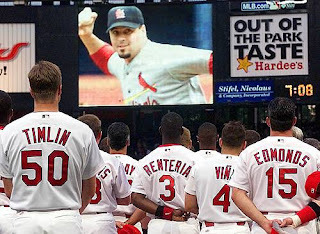 As testimony to his exemplary traits and the universal respect that he commanded, both the St. Louis Cardinals and Houston Astros annually recognize a teammate with the "Darryl Kile Good Guy" Award. The name itself speaks volumes about the player that was viewed as the consummate teammate, friend and father. In his first major league start, Kile was gracious despite being lifted after six innings while in the midst of a no-hitter. Perhaps that game serves as a metaphor for the great teammate, husband and father who was taken away far too soon in the prime of doing something very special.